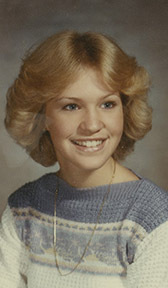 Louise Ann "Luanne" Rogers (1967-1988) was among the 270 victims of the bombing of Pan Am Flight 103 over Lockerbie, Scotland on December 21, 1988. Luanne was a senior at the Maryland Institute of Art studying in London through Syracuse University's Division of International Programs Abroad (DIPA). She studied painting, sculpture, and photography and had recently changed her major from interior design to fine arts. Luanne was survived by her parents, Oregon and Ann, and siblings, Becky, Ken, Lawton, and Jay. They remember her as "colorful and offbeat, Luanne did everything with style." A scholarship was established in Luanne's name at Sherwood High School, her alma mater. The Louise Ann Rogers Papers contain audiovisual materials and photographs, including a video presentation about Luanne. Oregon and Ann Rogers donated the Louise Ann Rogers Papers in 2007. The Louise Ann Rogers papers are fully processed.